This kit includes everything you need supplied and fitted, the price you see is the price you pay! A brand you can trust..
- The DVR is a 5-IN-1 dvr , & support sTVI/CVI/AHD/Analog/ONVIF IP camera all at the same time. - 1080P DVR can provide true color high definition image. - True 1080P Resolution camera provides clear and accurate video footage both day&night EXIR Technology. - IR-CUT filter provides true color image during daytime. IR LEDs privide high quality picture at night. - IP66 weather proof means this camera is suitable for outdoor locations. - strong shell ensures its waterproof & provides you a convenient and safe life. - Support multi channel simultaneous live viewing via your smart phone. - Support Cloud System For Remote Access/Support HDMI & VGA Output. - Simple to use and at a low price. - This CCTV security system is intended for domestic use but also could suit a small business. E. The individual video cables are routed back to the DVR position situated within the property. 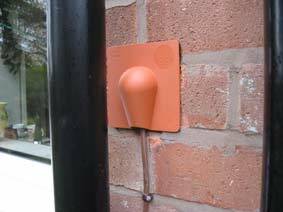 Where the external cables enter the property it may be necessary for the Engineer to drill a cable entry hole which will in turn be sealed with silicon sealant to prevent any water ingress. G. After the DVR has been connected to the video cables and monitor, the Engineer will configure the DVR to view/ record each of the separate video channels. Once configured, the Engineer will provide a quick system demonstration to show that the cameras are all in position and operational and that the DVR unit is recording/ playing back the correct imagery. H. Remote Viewing Setup (Optional) - With the CCTV System installed and tested, the Engineer will connect the DVR to the Customers Broadband via their existing Home Network/ Router. It is important that the Customer has an adequate Broadband supply (>2Mb) and available Router port access to route the DVR imagery to a web enable device. The Engineer will then load the "Hik-connect" App onto the Customers Computer/ suitable mobile device/ Smart phone with adequate mobile Broadband (Single device) before carrying final testing and a simple demonstration of the remote viewing facility. We pay You £10 for every friend you introduce, existing & new customers only. All kits can be changed and other brands are available. Still not sure? call us so we can give you all the latest infomation and updates regarding our CCTV systems 0800 2888 613. We use a fixed price booking structure to create a fair even price for all..
give you up to date information on the latest security systems. Installation can be carried out in as little as 2 hours, our trained professionals will guide you through the installation prior to starting work to ensure complete satisfaction. For more info, or to make a booking.